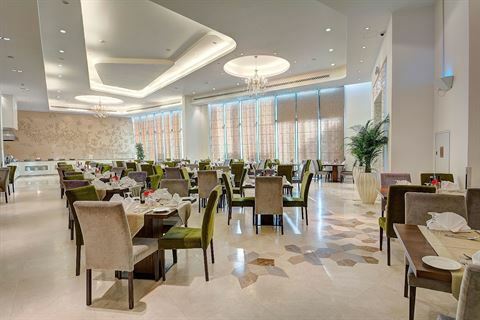 Crystal Restaurant at Copthorne Hotel DubaiCopthorne Hotel Dubai, the popular hotel located in Port Saeed in Deira, presents two nights of flavourful dining experience where guests can enjoy a rich spread of Arabic and Asian dishes. Enjoy a sumptuous buffet on Wednesday night featuring many Middle Eastern specialties. Savour authentic Arabic dishes starting from hot and cold mezzeh such as their home made hummus, fattoush, tabouleh, and stuffed vine leaves, to an assortment of kebabs, shish tawook, kofta and other mixed grill. Complete the evening with the all-time favourite Umm Ali and other Arabic sweets for dessert. Every Thursday, immerse yourself in a wonderful Asian Fusion culinary experience featuring live cooking for a variety of delicious specialties from the Near and Far East. Taste the contemporary delicacies from India, Thailand, China, Malaysia, Indonesia and the Philippines. Feast on Alu Gobi, Dal Makhani, Chicken Tikka from India; Kare-Kare from the Philippines; Spring Rolls and Noodles from China; Chicken Satay from Indonesia along with a variety of fresh salads, appetizers and desserts. This November, Copthorne Hotel Dubai invites families, friends or colleagues to gather for a delightful dining experience. The Arabic and Asian Fusion nights are offered for a reduced rate of AED69 per person including soft drinks while a group of 10 guests or more will get further discount of 10% from the total bill. Children under six years of age dine for free and 6 to 12 years old get 50% off. Crystal Restaurant, located on the ground floor of Copthorne Hotel Dubai is open from 6:30pm to 10:30pm. For reservations, please call +97142950500 or email fandbres.cdxb@millenniumhotels.com.